It can be incredibly hard to scale the core values that underpin an online community without having to throw resources at the problem. One music startup has found in-app messages are an invaluable tool in its arsenal. Plug.dj is a social music website where people from around the world watch music videos together in real-time. The song selections are curated by DJ’s who also chat with the audience. 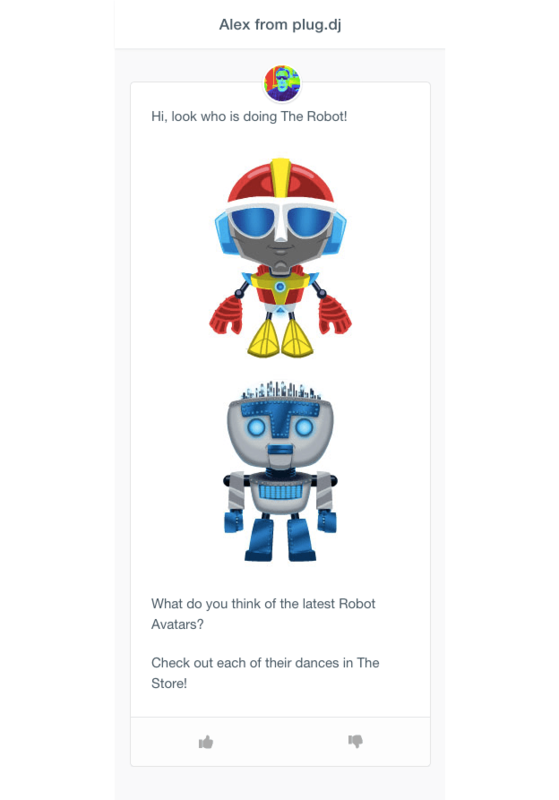 Everyone can take turns DJing their favorite song and every member of the community is represented by a fantastical dancing avatar (see above). Since it started in 2012 it has expanded to around five million registered users in more than 190 countries. What follows is a blog post by founder Jason Grunstra on the three auto-messages he uses to get people to convert, send feedback, and engage further with the app. Community is at the heart of plug.dj, and we place an extraordinary amount of value on every individual that chooses to spend their time in our app. But when you’re managing a community of nearly five million people in 22 different languages – and in a space as competitive as the music streaming industry – staying true to that core value is a massive challenge. How do we make sure our hundreds of thousands of monthly-active-users, in dozens of languages, learn about and take advantage of new features? How do you guide new signups to their first “aha” moment without annoying them? How do you stay connected and engaged with your passionate fans, most of whom spend over three hours a day in the app? How do you get quick and actionable feedback? The answer for us has been in-app messaging. A successful onboarding strategy hinges on effective communication, and in order for plug.dj to be effective we needed a tool that would allow us to segment people not only into locale-based cohorts but also behavior-based cohorts so we could deliver the right message at the right time. Intercom offered all the right tools we needed to scale our community with extremely limited resources. Here are the three most effective uses we’ve found for in-app messaging. 1. Announce new features through an in-app. The first step towards new feature adoption is letting people know it’s there. Previously, we announced new features in all the places our customers like to hang out: email, Twitter, Facebook, our blog. Were they working? It was hard to tell with certainty. After integrating Intercom we realized the most effective way to announce a new feature is through an in-app message. This ensures that 1) it’s the most timely thing a customer sees when they’re in the app and 2) they can act on your call-to-action immediately, without having to switch applications. This particular one gets a 40% response rate! 3. Guide customers to their first “aha” moment. We used Google Analytics and Amplitude to determine early win states, such as the first time you DJ and get a chance to really move the crowd with your awesome song selection. Those moments can be very emotionally gratifying and if we can help people get to those win-states within the app, we can pretty much guarantee multiple return visits and a 1000X increase of time on-site. Another example is when you level-up and unlock a limited edition avatar. We spent about 10 minutes putting together this simple in-app message for nearly 80,000 of our most active users, and in 5 different languages. It led to a 4% conversion, which is a significant number at scale and all with very little effort! A lot gets written about those quick tips and tricks for engagement, but I feel it’d also be helpful to explain how our workflow at plug.dj has changed to adapt to Intercom. Yes, we only have two dedicated community employees managing the frontlines of our Intercom app, but in reality the whole company gets involved. We integrated Zendesk so we can easily assign support messages to that team. We’ll assign foreign-language messages to the right people (my Czech is pretty bad). What’s great about Intercom is that we were able to get rid of at least four other engagement tools and put more focus on using just one tool really really well. 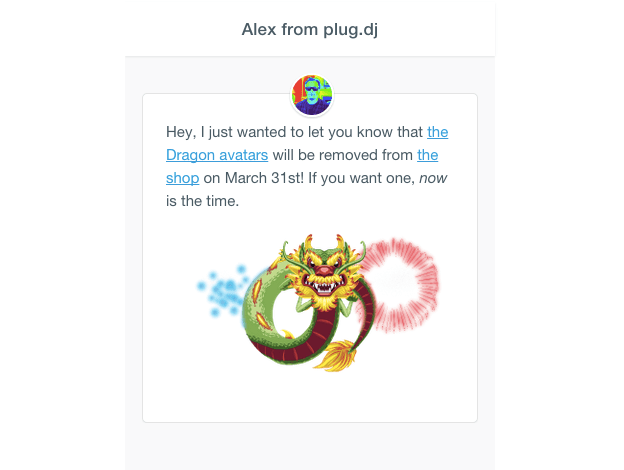 Localized in-app messaging is something we never had access to before, and to be honest, we were a bit hesitant to use it at first due to the sheer number of concurrent people that are using plug.dj at any given time, along with a bad prior experience with live chat software. Our concern was that we would get bombarded with tens-of-thousands of inbound messages and overwhelm our two-person community support team. We tried it on a small scale at first (something Intercom makes super-easy with segmentation!) and we have been so pleased with the results that we have started rolling it out to much larger audiences across multiple languages to inform customers of new product enhancements. Time is our most precious resource and it’s humbling to know that so many people count on plug.dj as their third place each and every day! The ease with which Intercom allows us to connect on a personal level with our customers and have a genuine human interaction with each of them helps us form the bonds that are so essential to building such a positive international community with millions of users.